Best Truck Driving Schools information on truck driver training list of trucking schools, CDL Practice Test. If you are looking for truck driver training you are probably making a career change and looking to make more money! The trucking industry is a great place to get a good trucking career job with great benefits and make lots of money. Now you need to find the right trucking school that fits all of your needs. The trucking industry has been shedding driving jobs and freight has been slowing down for the last year. Several companies are hiring again. Trucking school enrollment is up. For the most part driver training is no longer optional. Most carriers now require first time drivers complete some type of training programs. Some companies are now using computer-controlled simulators to recreate real world driving conditions. These are called in cab simulators. No state requires you to attend driver training school to test for a CDL. 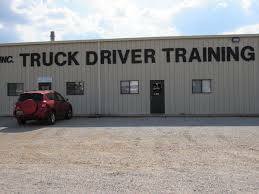 If you can find someone to teach you to drive and you can pass the test you get your CDL. Keys to Finding The Best Driving Schools. Compare Truck Driving School prices and see if they have applications for grants. Make sure you don’t have to travel to far to a school at your own expense. Most trucking schools will pay you for traveling. Will you have to pay for lodging and meals? Will there be a six student to one instructor ratio or 3 to 4 to 1? Make sure you ask. The lower the number of students per CDL instructor, the more quality time you will have driving a truck. You don’t want to spent half a year at a truck driver training school! You also don’t want a one week “give us your money, here’s your cdl” school either. Three to five weeks is about average. You will be driving a truck so you had better learn how to actually "drive a truck" as well as get your CDL. A skid pad is a giant special surface lot that is wet with water. It is used to practice recovering from skid with a truck. This is good training and I would recommend finding a trucking school that has a skid pad. Learning on the skid pad instead of on the highway is a good idea. Job placement is extremely important! What good is a cdl if you have zero experience and know one will hire you. Some trucking companies that hire new truck drivers require that you go through their truck driver training program first, thus you are paying for your cdl twice. I’m sure you don’t want to do that! Sometimes going trough a company training program is the best option for you. A company trucking school will want to train you properly because you will be driving their trucks and working for them as soon as you are done training. With this method you will get quality training and a trucking job fresh out of school. Make sure the trucking school you choose has job placement! After driving for only a few months you will be ready to move on to bigger and better trucking jobs. There are truck driver jobs that pay $65-$95,000 a year with the ability to be Home Everyday in the trucking industry. A person can get into truck driving and get one of these jobs with very little experience at all. Take your time and shop around for the best trucking school that fits all of your needs. Then get ready to go to the next level. Whether you are a new truck driver or an experienced driver your goals should be the same. Make the most per mile. Be home as much as possible. Pay as little for health care as possible out of your pocket. Have a pension, a good 401k plan or both. Not have to live in truck stops. Keep more of what you make.